It’s estimated that more than 400,000 kinds of plants (excluding algae, fungi and lichens) inhabit the earth. Basic knowledge about this plant diversity is based in large part on pressed, dried specimens that have been carefully preserved, labeled, mounted, catalogued and stored in natural history collections. 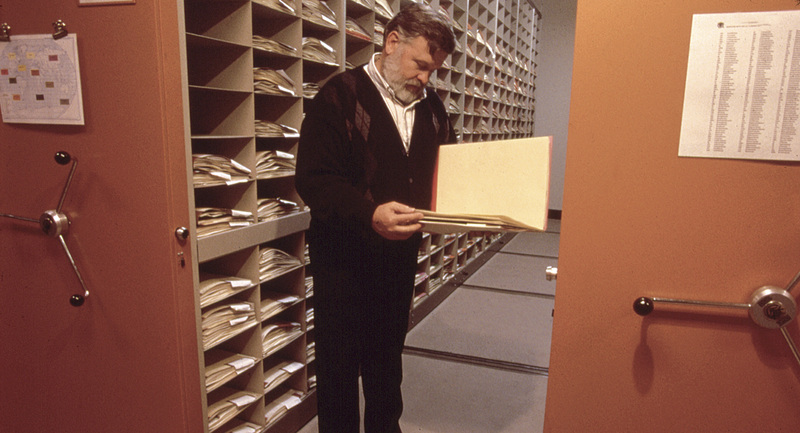 Such a permanent collection is known as a herbarium. The herbarium of the Missouri Botanical Garden has more than 6.5 million mounted specimens, with over 6 million ferns, conifers and flowering plants and 555,000 mosses, making it the second largest herbarium in the United States and one of the largest in the world. The nucleus of the Garden’s collection was the Johann Jakob Bernhardi herbarium containing approximately 62,000 specimens. Henry Shaw, the Garden’s founder, commissioned George Engelmann, a St. Louis physician and one of the foremost U.S. botanists of the 19th century, to purchase this collection from Bernhardi’s heirs in 1857. Bernhardi assembled his herbarium during the late 18th and early 19th centuries, so it included many interesting and important specimens from the exploration of South America, Asia, Africa and Europe. George Engelmann’s private herbarium of about 98,000 specimens was donated by his family in 1890. It contained major sets of specimens from many of the exploring expeditions to western North America and northern Mexico made during the middle of the 19th century. From this beginning, the herbarium has developed into an outstanding international research resource with a major emphasis on the New World and African tropics, as well as western and central North America. In 2014, the Garden added more than 108,000 mounted specimens to its collection through the exploration and collecting activities of its botanists and those of collaborating institutions. The Garden’s scientists are constantly traveling the globe to collect and study plants. At each place they visit, one or more individual specimens of each plant species are gathered from the wild, pressed (in newspaper folds), dried and sent to the herbarium. Once at the Garden, the specimens are counted, recorded and treated by freezing to kill insects that might destroy them. Labels for each specimen with information on where and when it was collected as well as descriptions of critical features about the plant are prepared from the collector’s field books. One specimen of each collection is selected for study and naming by a plant taxonomist who has specialized knowledge of the group to which the plant in question belongs. Once identified, a specimen from each collection is mounted and added to the Garden’s herbarium, and the duplicates are distributed to other herbaria in exchange for specimens from their areas of activity. The Garden exchanges specimens with some 400 herbaria worldwide. Part of the task of a botanist is to organize the enormous diversity of plants in the world into manageable units that can be named, characterized, described and discussed in terms of their relationships with each other and their role in the ecology of the earth. Most classification systems have a common basis: similar things are grouped together. Plants that are genetically related, physically similar and that (usually) interbreed are considered to belong to the same species. Several different species may have some characteristics in common. Such similar, genetically related species are grouped together in a genus (plural: genera), while genera with similar traits are grouped in families. For example, white oak (Quercus alba) is a species of the oak genus (Quercus), which, along with beeches (Fagus), chestnuts (Castanea) and other related genera comprise the family Fagaceae. The botanist who studies plants uses experience, literature and herbarium resources to provide the correct scientific name for a specimen. A specimen is named by comparison with other identified herbarium specimens and published descriptions of allied species. The plant may have characteristics similar to those of a species previously described or it may have features so different from those of any known species that it is determined to be new to science and never before described and named. Several thousand new species of plants are discovered, described and named every year. The specimens representing these new species are likely to have been collected in parts of the world previously unexplored by botanists, although new species are still discovered every year even in areas that have been visited by scientists many times. Given proper care, herbarium specimens will last almost indefinitely. The Garden’s collection contains plant specimens collected by George Boehmer in the 1740s, by Joseph Banks and Daniel Solander, who accompanied Captain James Cook on his first voyage around the world (1768-71), and by Charles Darwin on his voyage with H.M.S. Beagle (1831-36). These specimens are still as useful to botanists today as when they were gathered. Cooperation among the world’s herbaria is an integral component of progress in botanical research. In addition to the many gift specimens sent to specialists, the Garden’s herbarium loans an average of 25,000 specimens annually to researchers throughout the world and borrows about 20,000 specimens for its own staff. The herbarium staff also provides identifications from their area of expertise for numerous research projects and hosts about 300 research visitors each year who utilize the Garden’s herbarium and library collection to answer many kinds of questions from the theoretical to the applied.